The “American Dream” and the “Invisible Empire”: Donald Trump as “Anti-Woodrow Wilson”? A century ago, a Southern academic and racist emerged in Europe and the United States as a crusader to “make the world safe for democracy”.1 Wilson had been elected president in 1913, year before Europe’s imperialists plunged the world into four years of mass murder. That war alone, caused some four million direct battle casualties and untold millions of non-combatant deaths in the aftermath. Woodrow Wilson, despite the policies he actually pursued, would be turned into an icon of the 20th century’s most enduring myth—the benevolence and humanitarian virtue of the great slaveholder republic founded in 1776. Wilson could arguably be called the nation’s first celebrity politician and international celebrity export. This remarkable marketing accomplishment predated television. The successful promotion of Wilson on both sides of the Atlantic as the archangel of peace and the United States as virtual heaven on Earth was certainly made easier by the cinema (especially the newsreel) and mass literacy (although an overwhelming number of the soldiers slaughtered in the European theatre were illiterate). It was the organisational and manipulative skills honed during the campaign to bring the US into this initially European war that would empower the men who came to dominate the mass media—whose descendants dominate it today. So 2017 begins not unlike 1917. There has been no progress in the war—just a continuous flow of corpses and body parts, albeit mainly those of civilians in the alleged combat zones. In 1917 Wilson’s handlers needed to create the conditions by which the US population could be persuaded to surrender its men and boys as cannon fodder in Flanders and at the same time convince the belligerents in Europe that the US was not shipping soldiers and materiel to Europe to expand its own empire. These were no mean tasks. Aside from a significant faction among the ruling elite that was unwilling to spend money defending Britain (a competitor), there was the generally held attitude of a largely immigrant population that Europe was the place they had gladly left behind. Either they wanted nothing to do with Europe or they were sufficiently connected by family ties that they saw no reason to return to shoot relatives who happened to remain in Europe. As for the Black population of the US, they had nothing to say in the matter. The number of Blacks allowed to vote for Wilson was insignificant. Furthermore they did not need to go to Europe to be killed. It was dangerous enough being Black in the US. The US regime had neutralised the indigenous population and its ex-slaves were largely under control. Hence one could say that domestic peace (for whites at least) prevailed. 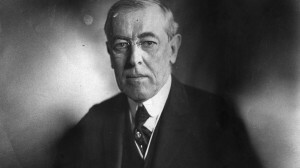 However in 1913 Wilson had signed the Federal Reserve Act.3 Explained as a law to establish economic and monetary stability after what had been one of the longest depressions in history, it actually transferred the nation’s finances to a para-state corporation dominated by the country’s most powerful banks—who after 1914 had also become the principal creditors of Britain and France in their war against Germany. In other words, the US regime had created a structure by which its fiscal and monetary policy would be made not by the legislature (as foreseen in the Constitution) but by committees of men for whom the outcome in Europe was far from a matter of indifference. Provocations had been fabricated in the past to justify US military intervention against weak or defenceless countries like Spain and Mexico (and the much hated Black republic of Haiti) whose inhabitants also were considered racially inferior. But a war in Europe would be a war against white people with comparable or even superior weaponry and military aptitude. The last war the US had fought against whites was half a century ago. The Civil War had traumatized the country for decades thereafter. Hence Wilson’s government was faced with a huge challenge: to create an image of the war in Europe, which could be sold to the white citizenry. Moreover it had to create the illusion of a threat to the country which could make the US intervention appear as self-defence. To do this it was necessary to create a new image of the USA. This image had to be compatible with the various narrative levels of the sales campaign. To accomplish this complex task, the Committee on Public Information was established. Since the British Empire had been the traditional enemy of the US since 1776, a story had to be concocted in which the US and the UK were now friends bound—as opposed to enemies separated—by history. Then a story had to be invented as to why the German Empire, only constituted in 1871, was an enemy of the US although there had never been a war between the two countries. A story also had to be told that there was something common between Britain and France (historical enemies and constant competitors) and the US, which made them the natural allies of the United States. Then there were some tricky details. A lot of immigrants actually came from Germany and or had family ties to different parts of the German Empire. Until recently there had been no reason to give this much attention. Now it was entirely possible that such German immigrants would be asked to fight against Germany. Could they be trusted? What about the Irish who had no reason to love Britain as the colonial master of their ancestral homeland?5 Complicating this was the known activism of Germans in the emerging labour movement. Then there was the large number of rural and semi-rural inhabitants far from the centres of power. Leaving aside the notorious ignorance of world geography and affairs, of those farm boys and ranch hands who could be recruited to take land from Indians and Mexicans: Would they volunteer to get their guns and sail far away to Europe, where there was no land to grab? Democracy, a system of government whose spurious origins are attributed to the slave-holding society of ancient Greece, was redesigned as the perennial flower of a state whose landowners and financiers had consistently resisted every attempt to deliver it to the vast majority of the country’s population. At the same time the “melting pot” fantasy was invented to explain why previously separate immigrant communities, successively imported to exploit whatever group had landed in the previous generation, were now mysteriously all Americans. These ethnic and language groups were inoculated with the holy spirit of Manifest Destiny, the political equivalent of the “gift of tongues”—in reality the sediment of America’s acidic political system. Germany was then reduced to a mere rapine horde of cannibals, ruled by a fanatical dictator (an image to return throughout the 20th century in the depiction of the regime’s enemies). The German emperor, a cousin of the then-reigning British king-emperor, was turned into the enemy of Democracy and humanity.7 In essence, the Hohenzollern king-emperor was simply turned into the logical opposite of the emerging fiction. The diplomatic manoeuvres by which France had assured that Germany went to war remained concealed so that even today charitable historians insist that Germany was the sole cause of the war.8 The vicious image of Germany then had to be turned into a real threat to the innocence of Europe. The sinking of the Lusitania (the Latin name for Portugal), a British merchantman plying the Atlantic with munitions, but loaded simultaneously with American passengers, became the Maine or the World Trade Center for US propagandists. The German imperial government had published ample warning in the United States that the ship was transporting munitions to Britain and as such could not enjoy the benefits of neutral shipping. Despite public knowledge that the British ship was deemed a legitimate target for German submarines, the ostensibly neutral US government did nothing to discourage its citizens from taking passage. When it was duly sunk, outrage followed. The incident was converted into a casus belli for the United States regime to abandon its previously declared neutrality and to openly side with the British and French in the European imperialists’ war. The bankers’ president reacted according to a script that is followed to this day. Only then is it possible to grasp the peculiar reaction to Donald Trump’s election in 2016 to the highest elected office of that invisible empire, with its ubiquitous invisible army. George W. Bush was mocked. Barack Obama was canonised. But Trump—who is in every way as much a creature of the real US as his predecessors and competitors—is reviled and treated as a threat to world peace. Ronald Reagan—who actually joked on camera about nuking the Soviet Union—has been forgotten, like the Alzheimer’s he no doubt brought into office. Not even a month has passed since the inauguration of Mr Donald Trump of Trump Towers as the 45th person authorised by the US Constitution to occupy the slave-built mansion at 1600 Pennsylvania most appropriately named the White House—which with the notable exception of one Kenyan-American and his family, has also been occupied solely by men who consider themselves to be “white” and their domestic servants often enough of the “coloured persuasion”—and the Washington correspondent of the liberal Lisbon daily Publico reported that the world economic system is threatened with destruction by one of the most notorious (though certainly not the richest) New York real estate magnates.15 No irony was intended. Portugal, a country whose cultural significance, were it not for Brazil, would probably compete with that of Belgium or Finland, is about as far as one can get in what North Americans call “Old Europe” from the centres of power. Its last great moment was 1755 when the destruction of Lisbon by an earthquake precipitated a European financial panic.16 Since then—as the 2008 casino collapse amply showed—it has been sufficiently far from power to have become a very realistic place—a showcase for the fraud that drives that world economic system and how a people accustomed to poverty and neglect by their rulers still manages to maintain a kind of quiet dignity and decency noticeably lacking in the Western hemisphere. This reader had to ask which world economic system was threatened with demise by the new tenant in Washington’s most exclusive rental property? By what logic or stretch of the imagination is one to believe that a man made wealthy by real estate speculation in one of the most manipulated property markets in the world could even conceive anything that would destroy the basis of his family’s wealth? Did we all miss something? 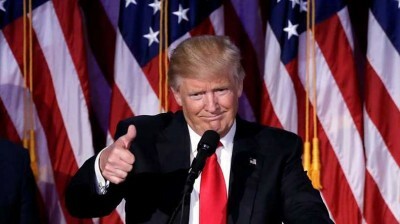 Is or did Donald Trump become a communist—even after the collapse of the Soviet Union ostensibly proved to us all that there is no alternative to capitalism? Another bizarre headline heralded the “end of political correctness”.18 For those who follow this line of thought it may be helpful to remind them that “political correctness” originally meant the hypocritical and deliberately divisive appropriation of the language of political liberation to undermine the very liberating goals of ending various forms of exploitation and oppression based on race, class, or gender. It is a testimony to the effectiveness of reactionary propaganda that the language of liberation has been converted into an instrument for defending its opposite. It is also proof that language is not isomorphic with the real world—an insight only appreciated when the managers of language—the mass media in all its permutations—attack those who hold views with which they cannot agree. Nazis and the now largely defunct communist parties of what was once called the Soviet bloc are the only ones whose use of language was supposedly deceptive or simply dishonest. In what was once called “the West” or the “free world” the unrestricted expression of ideas was claimed as an exclusive property. Per corollary everything said or written in the West was per se free (and putatively true) whereas everything said in the “East” was putatively false and composed of lies. No matter how many lies were exposed in the West, the West was still “free” and “true”, while no matter how accurate or intelligible the communication in the East was, it was composed prima facie of lies. The fraud was only exposed when nationalist governments in those countries tried to enforce compensation for eminent domain actions based on tax returns that had been filed under previous regimes. John Blair, in two studies produced while he was an economist for the defunct US Congressional Committee on Transnational Corporations, wrote quite clearly that the US Government has no reliable economic statistics because it is almost impossible to get accurate disclosure from the principal economic actors—business corporations.20 In other words, the world economic system that Mr Trump supposedly endangers is so opaque that not even those employed by the government to routinely record and analyse its activity are able to attest to the reliability, let alone veracity of the data disclosed. How this condition can be reconciled with the dogma of free information in the West defies comprehension. So let us leave aside the “nuclear threat” Mr Trump supposedly poses to the world economy, as we know it. The fact is we know very little about it by those criteria we have been told we are to trust, e.g. the Press owned by those very corporations whose secrecy is all but inviolate. We have no reliable or honest information about the status of the world economy from anyone claiming the right to tell us its condition. In political terms we are not even entitled to this information since it is per se private property—free only for those who own it. Ultimately this means the only claims sane people can make on their governments is that they do or do not do certain things, which have a real economic impact—e.g. secure incomes or the basic needs for everyday life for real human beings. Of course that is where the central conflict begins. That “world economic system” to which not only the Portuguese journalist refers is not designed to satisfy real economic (basic needs of everyday life) problems. It is designed to satisfy the needs of legal entities called corporations and other subordinate fictions for those people who “own” them. So to return to plain language—the author for Publico is saying that Mr Trump poses a threat to the system by which existing corporations and their owners satisfy their needs. But these needs must not be too clearly specified since the more specifically they are described the more obvious it must become that they have nothing to do with what most of the world’s population expects from an economic system. The jargon of the world economic system is so pervasive that few people even realise that their own descriptions of the economy make it impossible to draw a direct connection between what corporations and their owners do and what effects those actions or omissions have on the struggle to satisfy the basic needs of everyday life. Here it is important to mention the ideological function of the so-called “priority of needs” pyramid which everyone taught economics and business administration in school or university learns. This pyramid claims that humans prioritise their needs beginning with food and shelter and in the last stage—when everything else is done—consider the acquisition of knowledge or wisdom or human rights. This “priority of needs” is really an argument for depriving humans of their humanity—which for better or worse means the necessity of determining themselves what best satisfies their basic needs. Like B.F. Skinner’s primitive behaviourism theories, the hierarchy of needs is really a trick to justify slavery, both physical and intellectual.21 The language is deceptively simple. The illusion of simplicity is intended to mirror a supposedly simple reality. But reality for humans has never been simple. Ungoverned by “instinct” and wholly at the mercy of language, it is impossible for humans to satisfy their own basic needs without cognition—essentially overt and covert verbal behaviour. Of course without cognition they can satisfy the needs of others—and that is why this clever metaphor is a standard “social science” explanation in a discipline that prides itself on pretensions to numeral-mathematical objectivity. The exaggerated fear of Donald Trump—not confined to the Portuguese middle class—can only be understood in terms of what the image of Donald Trump means to those fed on the American Dream—a neurosis cultivated in the advertising laboratories of Woodrow Wilson’s Creel Committee. This is not to say that people have no reason to fear the future exercise of US imperial and corporate power. Rather it means that Donald Trump—properly speaking the spectacle of Donald Trump, President of the United States—has infected the educated white population with a massive dose of cognitive dissonance. After the phenomenal “Blackwash” of the US “Global War on Terror” purged popular memory of the embarrassing George W Bush era, a garden-variety white billionaire threatens to undermine a century of brainwashing. This raises an even more important strategic question. Do the invisible people who rule the US not recognise the risk that Donald Trump poses for the carefully nurtured infatuation of Europeans and the white middle classes everywhere with the American Dream? Or do they feel this is an endgame? Are they convinced that they have sufficiently isolated Putin’s Russia and the Chinese tiger so that no matter what the US does it will retain the support Wilson’s Committee on Public Information so carefully engineered—if only because the US remains the lesser of all evils, makes the more popular films and controls the Internet? We cannot forget that the machinery, which maintains consent, ignorance and ideological conformity with the Business ideology of the United States, is still in place. It is entirely possible that Donald Trump is an accident or evidence of dissent in the US ruling elite—which is still overwhelmingly “white”. Given what we know—or could know—about this machine, the hysteria about Donald Trump may also be a crafted fabrication. Despite all the formal outrage over President Trump’s policies, not a single European government has threatened retaliatory measures against the US. Although Mr Trump declared NATO obsolete neither Greece—which cannot even afford to be in NATO—nor any other member has announced its withdrawal. Nor have there been any calls for such action in the mainstream or compatible media. So is this a lot of “wolf-crying”? What about the so-called real economy? Donald Trump has trumpeted that his administration will bring Chinese jobs back to the US. One might conclude that he is promising US corporations to reduce workers to the status of “coolies”. No government in Europe—and certainly not the European Commission—has any plans for restoring full-wage employment to its own citizens. The Guardian, part of the compatible Press in the UK, published an article by a “colour revolutionary” from the Gene Sharp cottage industry that brought us the spectacle of Yugoslavia’s explosion and the fascist coup in the Ukraine.24 The author asserts that no more than 3.5% of the population is needed to bring down a tyrannical regime. Apparently there was never 3.5% capable of forcing the release of thousands of Black Americans rotting in US prisons, including such political prisoners as Mumia Jamal or Leonard Peltier—although their “trials” have long been proven to have been rigged by the State. Nor can one avoid the question whether the “special relationship” between Britain and the US allow a major British daily to advocate an unconstitutional challenge to the elected POTUS (never mind for a moment that the US has one of the most archaic and least democratic electoral systems on the planet)? The sincerity of the 3.5% is apparently as selective as the interest of the infamous 1%. One hundred years after fabrication of the Good America myth, the nightmare of the “American Dream” seems about to end. The comedian George Carlin once said they call it the “American Dream” because you have to be asleep to believe it. Maybe it would be a good thing if Donald Trump’s election made people wake up. 1 Thomas Woodrow Wilson (1856-1924, US President 1913-1921) was born in Virginia and educated in Georgia and South Carolina before taking degrees at Johns Hopkins University (Baltimore) and ultimately becoming president of Princeton University before launching his political career. Among his contributions upon becoming US President was to introduce the post-slavery Jim Crow regime into the federal civil service. 2 Erich Maria Remarque, Im Westen nichts neues, was a best-selling novel (1929) describing the conditions on the Western front during World War I from the German side at least. In German “nichts neues” means “nothing new”, a more ambiguous title than the harmless sounding “all quiet”. 1910, the secret “council” was held at the Jekyll Island Club on the eponymous Georgia sea island where much of the US ruling class had been accustomed to spending vacations. It was attended by representatives of the US banking elite and its political officials in the Treasury and the Congress: Nelson Aldrich, A. Platt Andrew (members of the National Monetary Commission), Paul Warburg of Kuhn, Loeb & Co.; Frank Vanderlip, National City Bank of New York; Henry P. Davison, J P Morgan & Co.; and Charles Norton of the First National Bank of New York. Together they drafted what was called the Aldrich Plan. The Aldrich Plan in turn formed the basis for the Federal Reserve Act of 1913. 4 For details see Gerald Colby Zieg, Beyond the Nylon Curtain (1974), reviewed elsewhere by this author. World War I was “a great banquet of gold” for the Du Ponts who grossed over one billion dollars during the war (p. 131). 5 Any doubt about the British attitude toward Irish independence was removed when Roger Casement, who had played a leading role in exposing the slavery and mass murder in the Congo Free State under its owner, Belgium’s Leopold II, was hanged by the British for treason because he took his Irish nationality seriously and was convicted of accepting German promises of aid to the Irish nationalist struggle. It has been suggested that the British were killing two birds with one stone since Casement had earned the enmity of the Belgian empire too. 6 See Gerald Horne, The Counter-Revolution of 1776 (2014), reviewed by this author elsewhere. 7 Wilhelm II was a welcome guest in the United States before the war. This author’s grandfather was a witness to one of the yachting enthusiast’s visits to Newport, RI on the occasion of regattas in Narragansett Bay. 8 In 2013, Christopher Clark, an Australian historian “sympathetic” to Germany omits entirely Britain’s interest in provoking war in 1914. See The Sleepwalkers by the current Regis Professor of History at Cambridge University, also reviewed by this author. In contrast Carroll Quigley (1981) provides a more circumspect analysis in The Anglo-American Establishment, a book largely disregarded although Quigley was a Georgetown professor and Bill Clinton mentor. 9 English books in German schools still teach the long-discredited “Thanksgiving feast” story although it is a matter of historical record that Thanksgiving in the US was celebrated as a military victory—like Blood River in Afrikaner history’s Day of the Covenant—until Abraham Lincoln turned it into a national holiday of reconciliation between the North and South in the US Civil War. The American Dream is composed of little lies, exaggerations and outright falsehoods written into textbooks, film scripts and consumer-based celebrations exported wherever a buck is to be made. 11 George Creel, How we advertised America (1921) Creel was a journalist chairing a group comprising Madison Avenue advertising executives et al. See also Stuart Ewen, PR! A Social History of Spin, (1996). 12 Fittingly the dean of armed propaganda (counter-terrorism) in the US, Edward G. Lansdale (1908-1987), began his career as the advertising executive who made Levi’s jeans into the famous clothing brand it is today. For some odd reason the worshippers of the Internet forget to mention that it is the successor to the ARPANET, invented by the US military to assure that its computer systems would survive the expected retaliatory strike following the first atomic strike against the Soviet Union—the core of US strategic planning until the end of the so-called Cold War, as can be seen in the official history film produced by the Sandia National Laboratories, the R&D department of the US atomic war establishment. See https://archive.org/details/U.s.StrategicNuclearPolicy. The fact that almost all crucial servers for the Internet are located in the US—such that the EU felt compelled to adopt consent rules for the storage of data from European users on US servers—is never seen as a risk to “Internet freedom”. Never mind that virtually all Internet software, and much of the hardware, originates from US corporations. The answer: “Because there is no U.S. Embassy in Washington D.C.” In a conversation the son of a Honduran tobacco plantation owner told this author that in the nation’s capital, Tegucigalpa, the three most important buildings in the country were the Catholic Cathedral, the headquarters of the Honduran armed forces and the US embassy, whereby the latter was paramount. 15 Rita Siza, “Trump começou a desmantelar a ordem comercial global” Publico, 24 January 2017, pp. 22-23. 16 This event also played a central role in Voltaire’s satirical novella Candide, a work later adapted by Lillian Hellman and Leonard Bernstein to dramatize the political atmosphere of the United States during the post-WWII purges. 17 Treaty of Methuen named after the British diplomat, John Methuen, who negotiated this treaty with Portugal in 1703. Ostensibly a commercial treaty, the British Empire essentially guaranteed Portugal’s sovereignty (against any challenges by Spain) in return for what would now be called “most favoured nation status”. In the course of Anglo-Portuguese relations, Portugal would sacrifice its textile industry to Manchester in return for privileged access of its wine to British markets (e.g. Port and Madeira) and open its Brazilian ports to British merchants. Arguably the Treaty of Methuen made Portugal a permanent extension of the British Empire on the Continent. 19 This was the real source of conflict between United Fruit and the Arbenz government that led the CIA to overthrow the Guatemalan president in 1954. It was also the reason why Fidel Castro nationalised assets of major US corporations—they had refused compensation based on their fraudulent tax returns filed under the defunct Batista regime. 20 See John Blair, The Control of Oil (1976) and Economic Concentration (1972). 21 B.F. Skinner, About Behaviorism (1974) Skinner’s research coincides with a whole range of programs funded by the CIA to investigate manipulation of human behavior. Skinner’s most famous books were Walden Two (1948) and Beyond Freedom and Dignity (1971). It is entirely possible that his work was wittingly or unwittingly promoted by those sources of academic largesse. For a stark contrast to Skinner’s “biological determinism” see Morse Peckham, Explanation and Power: The Control of Human Behavior (xxxx). 23 Philip Agee, CIA Diary (1975). 24 https://www.theguardian.com/commentisfree/2017/feb/01/worried-american-democracy-study-activist-techniques Gene Sharp (*1928) is a retired political science professor from the University of Massachusetts Dartmouth and researcher at Harvard’s Center for International Affairs, who founded the Albert Einstein Institution in 1983. The institution’s funding has come from the entire host of US political warfare foundations—NED, IRI, Rand, Ford. His cottage think tank (amusingly also located in Cottage Street, East Boston, Massachusetts and its role in the manufacture of synthetic “revolutionary” movements is the subject of a documentary The Revolution Business (https://www.journeyman.tv/film/5171). OTPOR—meanwhile renamed—played a central role in orchestrating the media campaigns that made Milosovic’s Serbia the tyrannical cause of the war which with the power of the US—exercised by counter-terror expert Richard Holbrooke—forced the destruction of the Yugoslav Federation in the early 1990s. The process was described in detail in the documentary The Weight of Chains (2010).